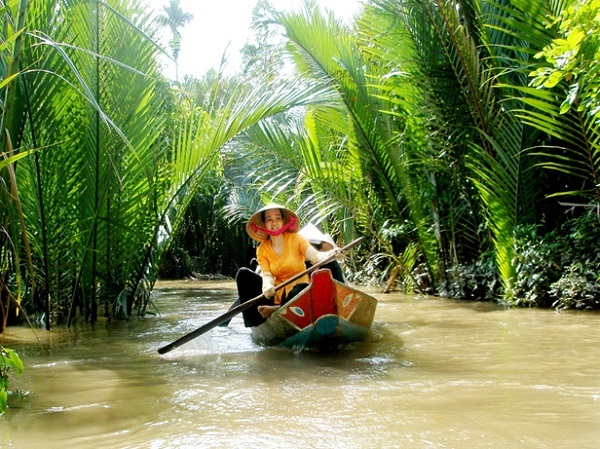 The Mekong Delta is usually called as Vietnam’s “rice basket”. It is a watery landscape of green fields and sleepy villages, everywhere crisscrossed by the brown canals and rivulets fed by the mighty Mekong River. Travel the Mekong Delta always attracts many tourists with its breath-taking scenes and unique culture and lifestyle. 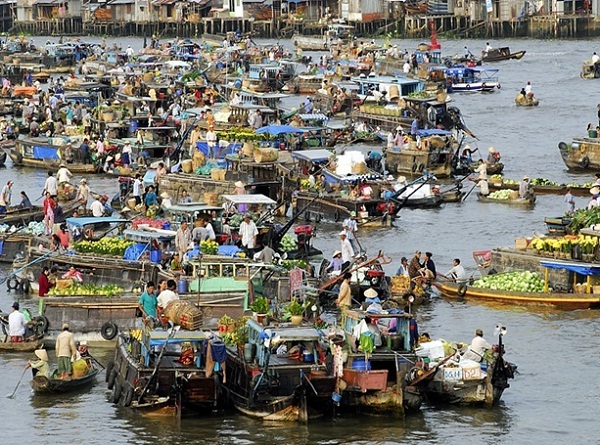 Full – day Mekong River tour from Ho Chi Minh City will create chance for you in order to explore the Mekong River by boat during a day, visit local villages and experience the traditional culture of Vietnam’s Mekong Delta. Often referred to as the rice bowl of Vietnam, the fertile Mekong Delta is famous for its agriculture as well as its tropical fruits and flowers. Boating along these canals and visiting the floating markets always proves to be a fascinating and rewarding experience. On this full-day trip, you will boat through the lush green vegetation of these famous canals. Next, you will boat through the lush green vegetation of the canals to an orchard, where you will be treated to a delicious lunch of Mekong cuisine at Diem Phuong Restaurant. After lunch, you will return to My Tho for a visit to Vinh Trang Pagoda. Tourists visiting the city of My Tho in Tien Giang Province could not miss Vinh Trang Pagoda, an ancient southern architectural gem and one of Vietnam popular destinations. The pagoda is located in My Phong Commune, which is three kilometers from the city center. 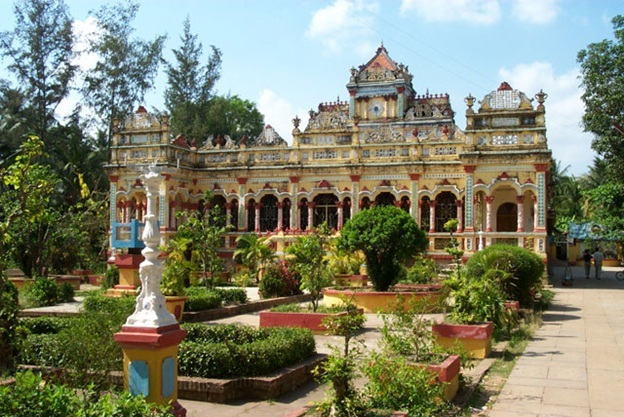 It was built in 1849 by a Buddhist monk named Hue Dang using funds collected from practitioners. There are three entrances to the pagoda. The central Iron Gate is always closed, while the two side gates, which are designed in the Co Lau style, are open. The side gates are adorned with colorful porcelain mosaics featuring Buddhist folktales and natural scenery. After visiting Vinh Trang Pagoda, you will head back to Ho Chi Minh City and your tour will end. Joining this full – day Mekong River tour, you will have chance to explore Mekong River canals and floating markets, enjoy a delicious Vietnamese lunch at one of the tropical orchards, meet locals as you explore the villages and islands along the Mekong River, see Vinh Trang Pagoda and visit the bustling port city of My Tho. 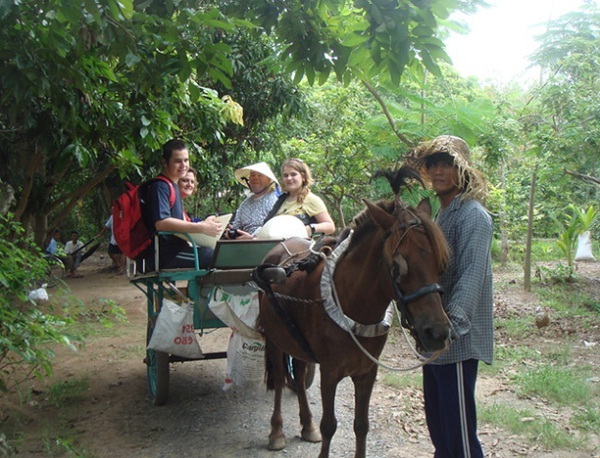 Surely, after this tour, you will understand more deeply about the Mekong Delta and have memorable experiences.